By Audrey Golden. Nov 12, 2016. 9:00 AM. Many readers of Pablo Neruda’s work are familiar with the cinematic depiction of the Chilean Nobel Prize winner in the 1994 film Il Postino, set on an Italian island. Since the release of Il Postino, the poet has maintained a loyal following among readers and academics, yet his fictional likeness hasn’t appeared in another film—until now! A new film, simply entitled Neruda, has been making its way through the festival circuit. The movie reimagines Neruda’s exile from Chile in the 1940s due to his politics, helping viewers to think through the continued relevance of political refugeeism and forced migration in the twenty-first century. We’re entirely too excited to see it, and you should be, too. 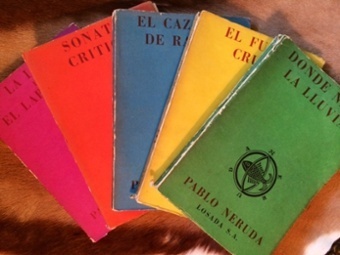 Neruda was directed by the Chilean filmmaker Pablo Larraín, already well-known in Chile and abroad for directing such films as Tony Manero (2008) and No (2012), and for developing the television series Prófugos (2011). The director is no stranger to depicting Chilean political struggles on film. In case you haven’t yet seen it, No depicts the Chilean “No!” advertising campaign from 1988 aimed at defeating then-dictator Augusto Pinochet. Now, with Neruda, he has created a fascinating period piece of sorts that draws attention to an earlier period of Neruda’s life in exile. As Larraín mused, “Is it a thriller, a drama, a comedy? We didn’t know.” Yet “what I do know,” Larraín said,” is that, more than a movie about Neruda himself, it is about the Nerudian—his world, his imaginary place.” Another review** in The New York Times calls the film “the anti-bio,” noting that it is “part fact, part glorious fantasy.” Thus far, Neruda has been almost universally praised by critics and viewers alike. Indeed, its recent acquisition by a North American distribution company was among the “first big sales” at this year’s Cannes Film Festival. Since even the director himself cannot place Neruda into a specific genre and could not think of appropriate language to describe it for the purposes of the Cannes judges, we can’t imagine that we can do better. We can give you some more details about the film, though, in hopes that you’ll find a way to see it for yourself. The screenplay was written by Guillermo Calderón, and it stars Luis Gnecco as Neruda. If you’re familiar with Larraín’s body of work, you might have seen Gnecco in episodes of Prófugos or starring as José Tomás Urrutia in No. Gnecco is not the only actor to have worked with the director previously. Neruda also features Gael García Bernal, a favorite among many directors who also starred in Larraín’s No. Unless you can make it to one of the major film festivals, you’ll need to wait a short while to see the film. It’s currently scheduled for release in the U.S. on December 16, 2016. 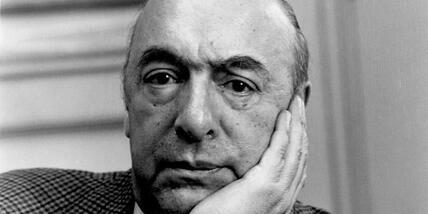 Mark your calendars, and in the meantime, why not revisit some of your favorite works of Pablo Neruda? *Read the full Los Angeles Times review here. **Read the full New York Times review here.